mr. nice guy's eyebrows were raised by this month's cover article in the national geographic. 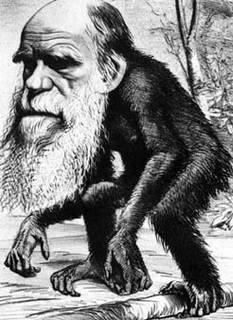 david quammen asks the question: was darwin wrong? and answers, resoundingly, no. first of all the title of the piece is a cheap device to lure readers in. going by the copy alone, the hed should have been "darwin was right." there is never any question (the first word of the freakin' article is "no"). but how NatGeo chooses to sell its magazines is neither here nor there. seriously. darwin has to be wrong. you want proof? look on my couch. observe the shell of the woman that once was my vibrant wife. (no, the "benedictin" isn't working.) then answer me this: what is the evolutionary benefit to pregnant women spending months on end exhausted, puking, miserable, grimy, depressed, hormonal, hysterical, needing and generally glum bums? can't think of one? that's because there isn't one! why would a woman, after having endured months of stomach-churning nausea and general hysteria ever want to go through it again? why would friends and relatives witnessing the torment of a loved one want to go through it themselves (or inflict it upon a significant other)? it is a sheer miracle that the human race has lasted as long as it has -- forget bombs and wars and chemicals and religion and politicians and paris hilton -- civilization should have ended millennia ago. or maybe it's just that, as mrs. nice guy thoughtfully hypothesized this morning, my sperm is poison. HAHAHAHA! I was trying to think of an answer to your question. Seriously. But I think mrs. nice guy nailed it. stupid post from a stupid and nice guy.